Someone you know is turning another year bolder or it’s your fifth – or even fiftieth. Send them this radiant and fiery mix of yellow, orange, white and hot red flowers in a terracotta vase. Our sensational bouquet, Bonfire Glow is the perfect choice for birthdays, anniversaries and to congratulate someone on new beginnings or to show gratitude by saying Thank You. This is also a good choice to gift the host of the party, or to say sorry to your loved ones. 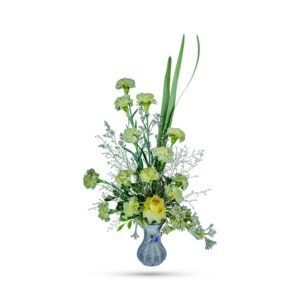 White carnations and orange Gerberas, white or yellow Lily and hot red spray roses – accented with Limonium or gypsy – are delivered in a classic vase decorated with seasonal leaves. Bring a smile to someone’s day with a bright mix of exceptionally lovely red, yellow, white and orange, and remind them of skies during sunsets and sunrise. 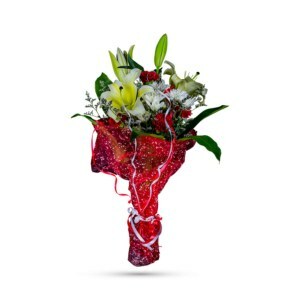 This big, beautiful bouquet – presented in a tall rustic vase – is sure to capture the attention of the receiver and others. 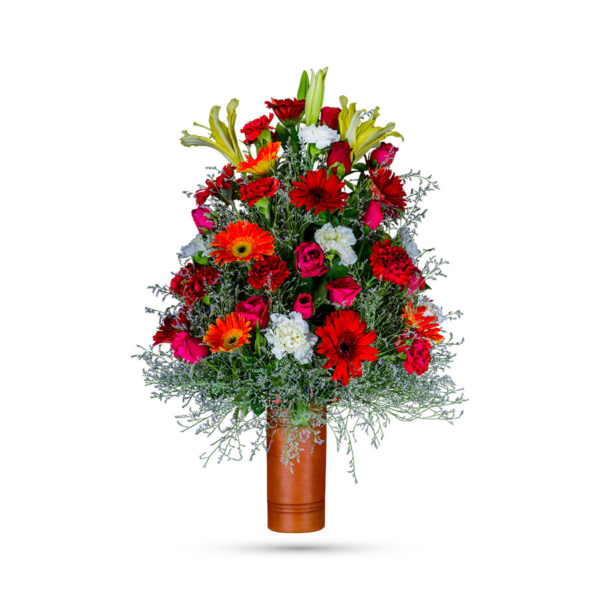 Floral gifts are a great way to send someone a very special greeting, and our fresh flower arrangements have that rare combination of inexplicable power and delicate charm which are available for home delivery right at your doorstep! 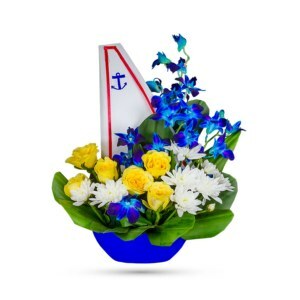 Simply peruse our website to order this bouquet online. As with all our bouquets, this includes a message card for you to drop a cute message!